Gravity Garden - Puzzle game with cosmonauts! 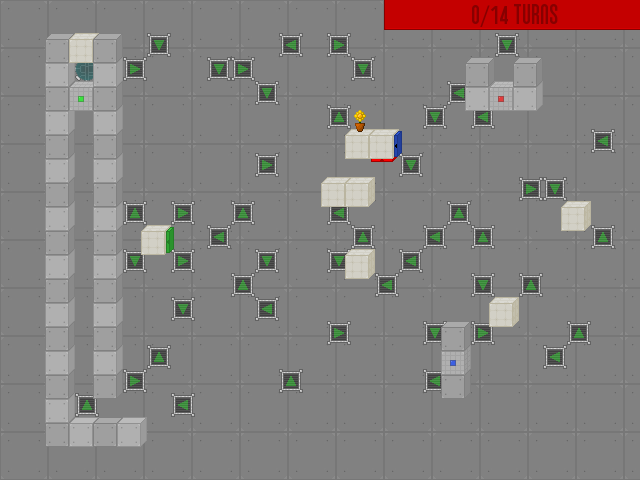 TIGSource Forums Developer Playtesting Gravity Garden - Puzzle game with cosmonauts! In Gravity Garden, you play as a new member of the crew on a USSR space station. Your job is simple: to transport a fragile, potted planted from testing chamber to testing chamber without breaking it. However, it is in fact so fragile that a human touch would kill it. Due to a lack of funding, there is no equipment to transport the plant with, and so you have to resort to the Variable Orbital Drift Kinetic Alternator - in other words, your only choice is to change gravity within sectors of the ship to send the plant hurtling toward the next room. Unlike most gravity-changing puzzle games, however, everything in the room is affected by the change of gravity, leading to some very complicated setups. I'll be the first to admit that the setup for modding in this game is less than ideal, as it was my first time dealing with parsing of human-readable files and dynamic data storage and such. 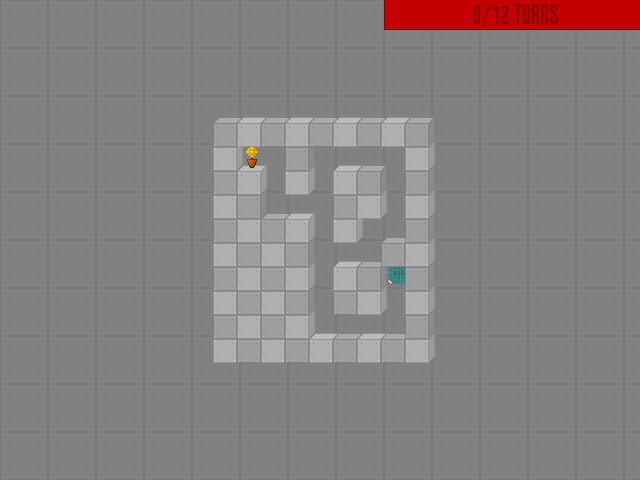 However, it is entirely possible to make your own levels and objects, or even skins for the game's GUI and objects. Take a look at Documentation.txt - it covers everything you need to know. If you'd like to post your levels, you can do so in this topic, or you can post them at the official forums for all 3 community members to see! On the level select screen, a single locked or level perfect icon will not render. This issue is easily fixed by re-entering the menu, but it looks weird. This is likely a problem buried deep inside a mess of spaghetti code, so it may take a bit of work to fix. If the parser fails to load data from an INI file in any way, it has a tendency to simply crash the game without an error. Once again, this is a problem deep within the year-old engine, so it may take some work to fix. Dir. Changers can cause some strange results when two objects hit each other while moving in different directions. This is more of a problem in design, and will probably not be fixed because there really is no way to do so. Simple fix: if you're designing a level, don't allow two objects to fly into each other in different directions. It's usually very easy to avoid. The engine was programmed by me in C++ using SDL. 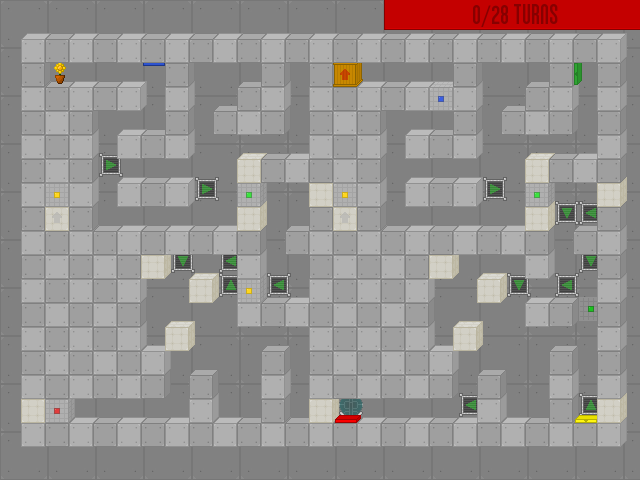 I also did about half of the level design, and a fair bit of the writing. Dauss did the character concepts and basically wrote the game's story, as well as doing the other half of the level design and writing. Hit F10 in-game and load one of those to see a replay of the level. Re: Gravity Garden - Puzzle game with cosmonauts! Please do give this one a try and let us know what you think, I think it's a great little game if I do say so myself, and I've been waiting on the edge of my seat for this to be released so you guys can take a look. A hotkey to next level would be nice to have after you a level. Hit Space once you've beaten a level. It'll automatically go to the next one. Controls are simple enough, graphics are pleasant to look at, the dialogue is humorous, and the level designs get very unique very quickly. I've had comments from a few people that it's unclear how to continue to the next level after you've beaten one. I uploaded a new version that tells you to press Space at the end of a level. Way better than the last time I played it! A little sad to see that there hasnt been much change in the graphics, but the menus and the people talking more than made up for it. Its got its own awesome style, and its funny to boot. Good job! The only thing i would have a problem with is the difficulty spike at level 3. I found it pretty hard to complete, now that may be because I'm an idiot, but it did seem a little hard for such an early level. Looks interesting! Just downloaded it, will give it a try and feedback. Yeah, the graphics are admittedly a bit plain. I'm glad you liked the rest, though! Fair enough, that level is a pretty big jump from the first two. It was supposed to introduce the idea that simple levels can still be difficult to beat, but I may have gone a bit overboard in that aspect. I almost felt like it didn't quite fit in with the later levels once buttons and other objects were introduced. That said, is there a specific place that it would fit better in the game? It's certainly not very difficult to change the level ordering if you have a suggestion. to be intros, but still it's ok. I absolutely love the soundtracks! Did you compose them yourself? Graphics are ... well, consistent. And dialogues are funny. All in all, very nice game. The music was done by one of Dauss' friends, Felix Arifin. I thought it was really well-done, too, and he's a nice guy to boot If you want to send him an e-mail, you can contact him at arifin[dot]felix[at]gmail.com. As TLB mentioned, my IRL buddy Felix was great enough to do the soundtrack for the game. Guy is a genius, and I think working on this game got him into Russian orchestra music, if I recall correctly. Games like this make my brain hurt... For that, I must give you kudos! Low Tide Productions - blog / Follow development of Duet! Thank you kindly. Just remember if you get realllllly stuck, hit F10 and load the replay for your level to see how it's done. In level selection menu, make level selection standing out more. At the moment, levels completed as "perfect"(yellow line square) stands out more than level that is currently selected. It's not a big deal but it is better for understanding. I really really like this, very very nice. I love the style. Did you use time based frame's or SDL.delay to make it move so smoothly? One problem I have with it though, I have to keep reading the text, is there a way to turn it off? Or perhaps have a tutorial level that doesn't need to be played that explains the game mechanic away from the main game. One problem I have with it though, I have to keep reading the text, is there a way to turn it off? The C key skips dialog.